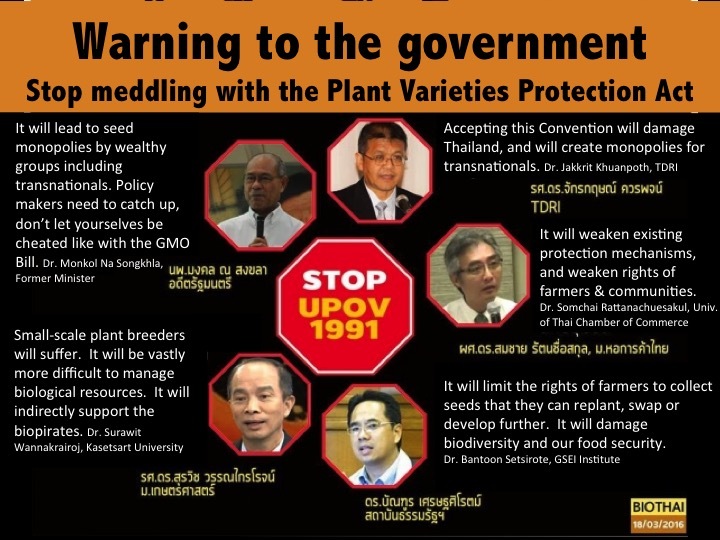 This was the warning given by a former Minister of Public Health who knows all about food and medicine monopolies, as well as leading academics with expertise in the fields of intellectual property rights laws, plant breeding, and biology, when they learned of the Department of Agriculture’s proposal to amend Thailand’s 1999 Plant Protection Act to follow in the footsteps of the UPOV Convention. The Department claim they seek to modernise the law, to prepare the way for the AEC, and to promote investment from transnational groups in the seeds industry. It is worth remembering that 19 years ago, a similar group of academics got together with civil servants within the Ministries of Agriculture, Health, and Commerce to protect the interests of the country and, with the collective support of smallholder farmers networks and NGOs, successfully pushed for the 1999 Plant Protection Act, which established a balance between giving appropriate incentives to plant breeders and protecting biological resources, without undermining the rights of farmers. Thailand’s Plant Protection Act of 1999 became the model for many other laws in other countries around the world, including India, Latin America and the Organisation of African Unity (OAU) countries. The 1999 Plant Varieties Protection Act upholds the principle of national sovereignty over biological resources, and respects farmers rights in accordance with the Convention on Biological Diversity (CBD), the international treaty to which almost all countries around the world have committed (with the major exception of the USA). Thailand’s law was deliberately drafted to reject the terms of the 1991 UPOV Convention, which had been pushed for by the United States. The UPOV Convention was well known for favouring giant seed corporations over the interests of smallholder farmers and national sovereignty over biological resources. It is time for another major push to project our biological resources, protect the rights of smallholder farmers. It is time once again to oppose the seed monopolies and the destruction of our country’s food security!